Build Something Beautiful, Together! – Spedtacular Me! 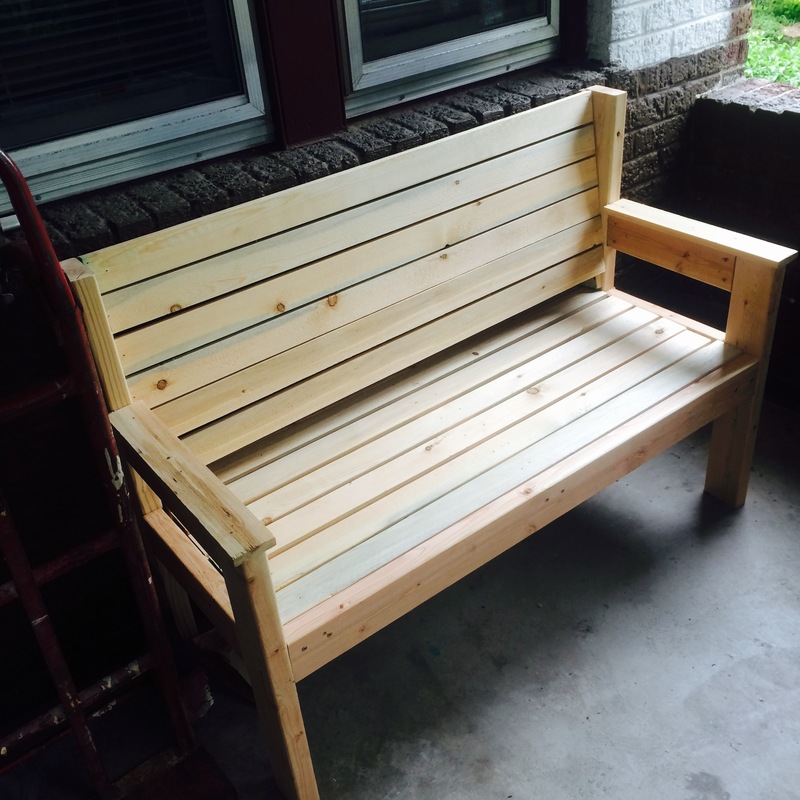 This is a re-post of a blog I wrote two years ago when Mr. H and I first moved in together, we decided to build a beautiful bench to go on our new super cute porch at our super cute house back when we lived in Denver. As we built this bench I realized that the process of putting the bench together was a lot like the process of putting together a healthy relationship and so this blog post, and eventually this website harrishomemade.com were born out of this idea, that we could physically and relationally build something beautiful, together. So what does this bench have to do with my marriage? Well we built it.. no kit, not precut pieces of wood, nope just a youtube video and a trip to home depot later and we were making a bench. This took both of our strengths and some I don’t think we knew we had in order to accomplish it. 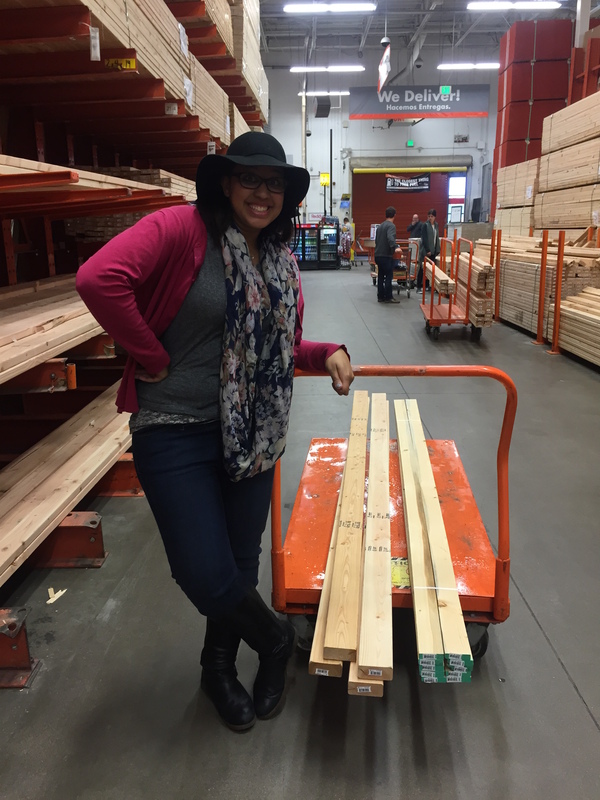 Here I am at home depot, bright eyed and bushy tailed ready to construct our very own bench, something that will hopefully last 30 years so we can pass it down to our children, as his parent just did with a picnic table Mr.’s Dad built 30 years ago. Did I mention we decided to build this bench on the day it snowed in May? No? 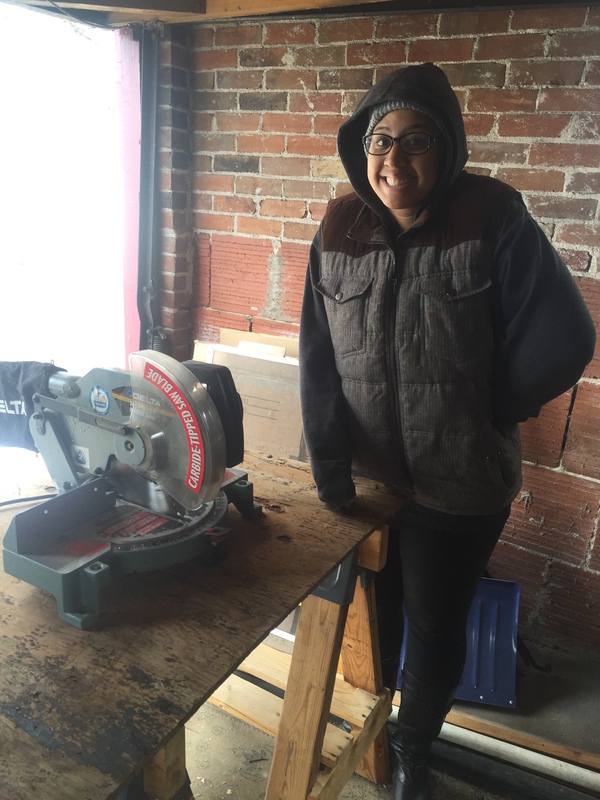 Oh well here I am bundled up in our garage waiting for the snow to melt as we begin sawing. 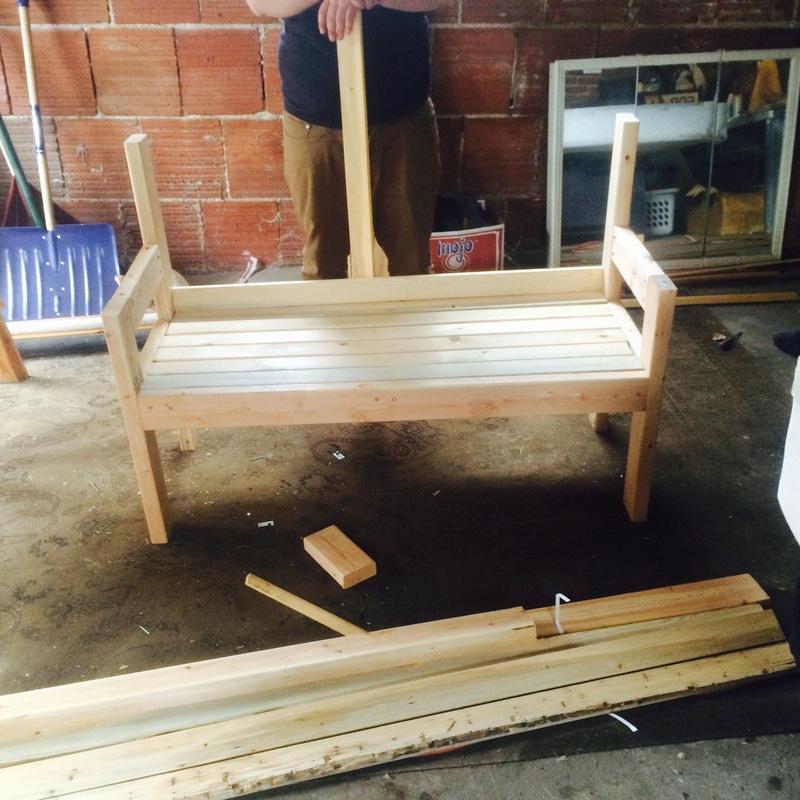 But we get underway constructing this bench and just like I imagine we will in marriage, we started to hit some bumps, my bright eyed and bushy tailed turned into curse words and we were soon doubting if we could put this bench together at all. It started when we realized we didn’t charge the drill, and were left screwing most of the screws in by hand, do you know how many screws it takes to put a bench together? Way too many to screw them in by hand I tell you that. And I am sure he was thinking that I could be helping more, or stop nagging him about the directions, I am sure I screwed a screw in wrong, or measured the pieces of wood too small ( ok I know I did that one once) And he could have taken those things and created a list, an arbitrary checklist of the ways I was failing him and allowed that running record to eat away at his faith in me. in us. But he didn’t every time no matter how frustrated he was he would look at me, smile, say “you are doing great babe”, and move on… EVERY time. And then we screwed the legs together wrong, leaving us with what would have been a seatless bench, not very effective right? So unscrew the pieces, and start again, this time following the directions. This is where we could dip deep down into those gender stereotypes pull out the one that says men don’t follow directions put a big ole check mark on it and slip it back into our pocket of low blows to use next time. But if we are going to create a marriage that is built to last, what we really need to be doing is digging into that pocket of stereotypes and low blows and throwing them in that brand new recycling bin we just got and let someone else compost those. Because holding on to these things just creates an environment where both Mr. and myself could be digging deeper and deeper at each other until one of us breaks. Now 50 years into this bench building marriage we will have so many of these things we could be throwing at each other that there is no way to survive all of those bad experiences, but if instead we choose to recycle that crap, chalk it up to a mistake we both made and move on, then in 2,5 or 50 years we won’t be counting all the ways our spouse has messed up over the years right? It was starting to look like a marriage…. I mean bench, the pieces were all where they needed to be, it had legs it could stand on and a sturdy seat two people could sit on. But there was something missing, just like our marriage which has 79 days until it becomes official ,our bench was missing some crucial pieces to it’s structure. But this is where it really got tricky, the video said to put the back at a slight angle so that it would be more comfortable to sit on. The guy used a fancy tool to measure and then drill sideways through the posts in order to accomplish this with ease. However here we were with our dead drills, no fancy tool and only the few screws that we had purchased which were now to short for this job. How were we going to accomplish it? 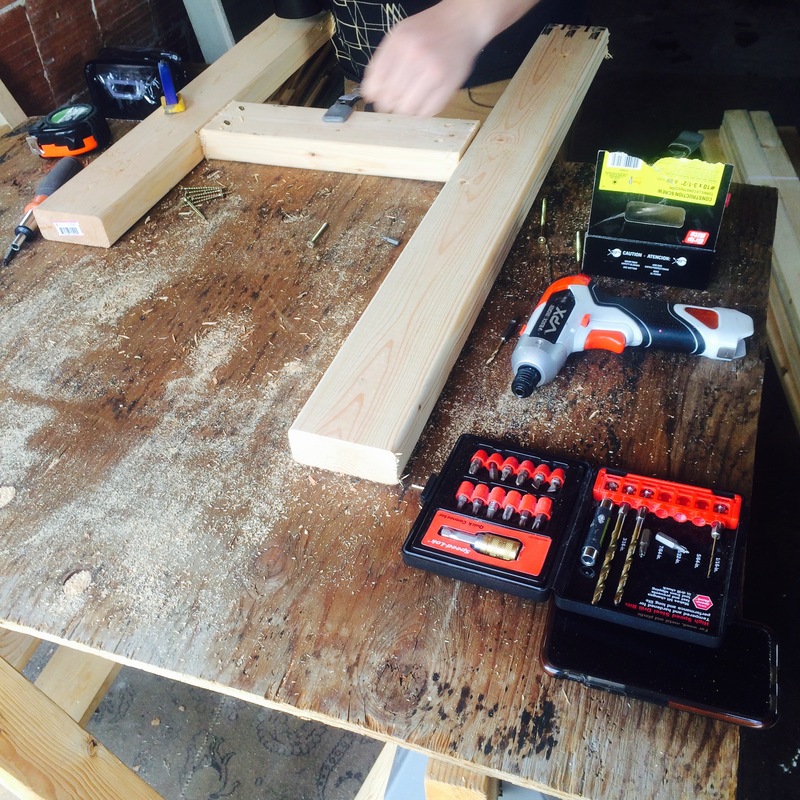 And then Mr. had an idea, he said why don’t we use extra wood, create a back for the ends and use that to nail into, that would cut down on the amount of screws we need and allow us to create the comforting angle we had heard about in the video. There you have it folks I am marrying a genius this is where I got to celebrate with him, think about how I never would have thought of that on my own and rejoice in his accomplishments, I could do this without fault because I had already thrown my earlier reservations in the recycling with our bench building mistakes. So that is what we did, and it worked! And in 30 years when our marriage has seen the test of time, I hope we will look at this bench think of all the things we could have held onto over the years, all of the little mistakes that could have torn us apart but instead made us a better team and think it all started with this bench. Previous postWe’re like a really small gang.